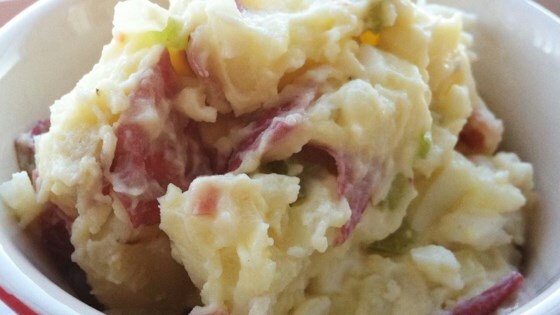 "A tasty alternative to the typical picnic potato salad. It's made with roasted red potatoes, bacon, eggs, green onion, celery, and mayo. Pretty easy to make and you can adjust most ingredients to suit your own personal taste." Spread potato pieces onto a baking sheet and drizzle with olive oil. Roast in the preheated oven until tender, about 45 minutes; remove from oven and let cool at least 15 minutes. Place roasted potatoes into a large salad bowl and combine with hard-cooked eggs, celery, green onion, and bacon; stir in mayonnaise and season to taste with salt and black pepper. Cover and refrigerate for 1 hour to let flavors blend. I used 2 Tablespoons of oil and ruined this dish. Simple and good. I added some fresh chopped basil but I would think other fresh herbs like dill or cilantro would be great too. Delicious! Everybody liked it. I used turkey bacon.